It is week 3 in the review of the CRM Field Guide Chapters from the book – The CRM Field Guide – How to CRM Like an MVP with Microsoft Dynamics CRM. This week it is the 48 page CRM Outlook Client Installation & Configuration. You might ask yourself – What could be so hard about this step? All I have to do is download the code and install the application and answer a few question. Truth be told, most of the time it is that easy. But once in a while there are some extenuating circumstances either due to the current state of the Outlook client or some other unavoidable/unanticipated issue with the client OS. This is especially likely in environments where the client computer isnt’ tightly controlled and the desktop or notebook user has full admin rights. Who knows what they downloaded and installed. The author identifies the 5 different methods for installing the CRM Outlook Client. For each installation the steps and most importantly real world experience & insight is served up. Take the pop quiz following the Installation Scenarios. It downloads the installation code with the options pre-set per my organizations current system. I have the option of which version of the code to install. It always downloads the most current software bits, insuring that all the latest update roll-ups are applied. After clicking on the download link I am given the option of turning off the installation prompt so it doesn’t show up again for that user and then the installation is automatically stopped. The chapter covers configuring the client for both CRM OnLine and OnPremise. The chapter wraps it up with some tips for troubleshooting the exasperating – There is a problem communicating with the CRM Server Error Message. This is not correct; you will still need to set the user’s options. 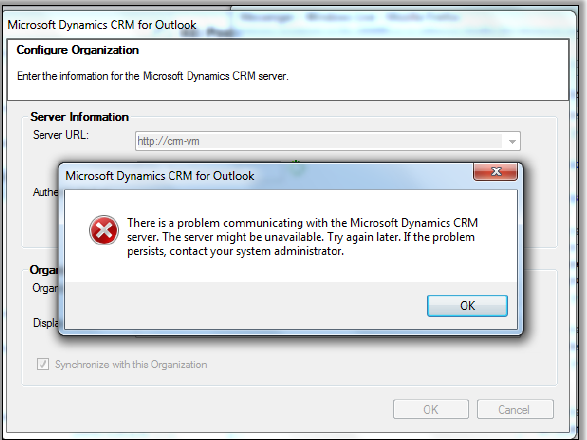 This is definitely not true and it is the primary reason not to use the Get CRM for Outlook Button. Bingo! This is the correct and only correct answer to the question. This is not correct. If you want to turn off the prompt you need to do this in the System Settings area. Wouldn’t this be nice if it was correct. If you didn’t get this question correct you have a perfectly valid reason why buying the CRM Field Guide makes perfect sense.